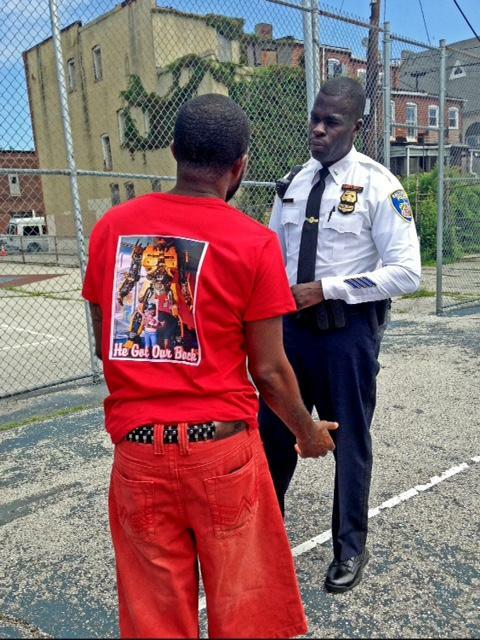 Video: Will Baltimore's Dirt Bike Riders and The Police Commissioner Come Together? This video is part of a special WYPR newsroom series entitled "On The Watch: Fixing the Fractured Relationship Between Baltimore's Police and Its Communities". Mary Rose Madden is the reporter on this year long series. This year-long special series is funded by the Bendit Family Foundation, Sig and Barbara Shapiro, The Zanvyl and Isabelle Krieger Foundation, and the Open Society Institute – Baltimore. B-roll footage from youtube video "Baltimore police ride-along taking a temperature in the western district"
B-roll footage from youtube video: "Baltimore policing has changed since the riots"
"Baltimore bike life dirtbike capital wheel deal"
"Riding with 12 o clock boys from New York Times"
On The Watch, Part 3: Will Community Policing Efforts In Baltimore Include Everyone? On the some of the hottest days of this summer, 14-year-old LaAsia Griffin and her big brother Jamal popped a white canopy tent and set up penny candy, chips, and crackers for sale on two long tables at a busy stop light in West Baltimore's Poppleton Neighborhood. On The Watch - What’s Essential To Community Policing? Every Wednesday night for almost two and half years, Tawanda Jones and her family gather on the street with supporters trying to get justice for her brother, Tyrone West. They chant, "I can't stop. I won’t stop. Until killer cops are in cell blocks". On The Watch, Part 2: How Will Baltimore Police Officers Respond To The Call For Help? On The Watch: How Will Baltimore Police Respond To The Call For Help? Three weeks before he was fired, Former Police Commissioner Anthony Batts held a meeting in a basketball court adjacent to a playground in West Baltimore. The community was invited to observe the meeting police were calling “community comstat”. On The Watch: What's Baltimore's Fair Policing Plan? Programming Note: Today, we start a police reform series called, "On The Watch: Fixing The Fractured Relationship Between Baltimore's Police And Its Communities". The series will run for the next twelve months. Please email the reporter at mmadden@wypr.org with any comments or suggestions. Crime in Baltimore is up, but police presence is down, residents say. Arrests have plummeted, open air drug markets operate freely and since May 1, six homicide victims were under 18.